This fundraiser is for my father’s mechanic’s son. 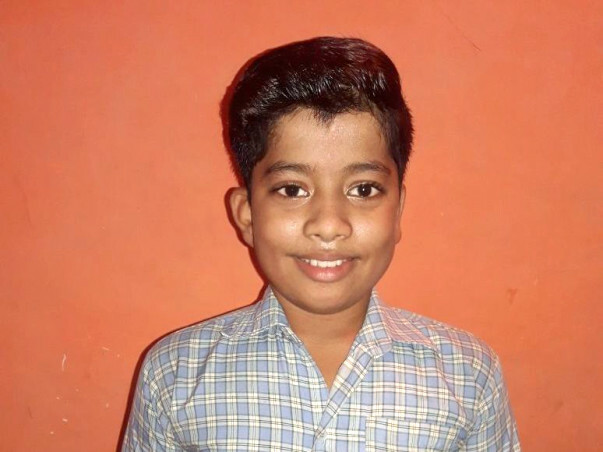 Prashant Ashok Jadhav, 11 years old boy hails from an underprivileged family struggling to meet both ends on a daily basis. He has Bilateral Profound Sensorineural Hearing Loss in both ears since he was a year old. He went through cochlear implant surgery in 2012. 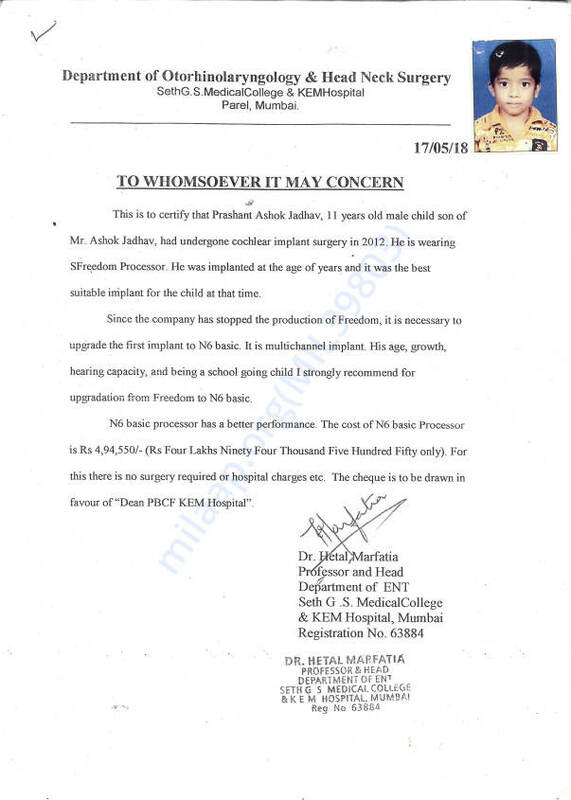 He is wearing SFreedom Processor which was implanted at the age of a year and it was the best suitable implant for the child at that time. Prashant started studying in school and was living a normal life aided by speech therapy. The implanted processor has been stopped functioning and the company has stopped production of the similair processor hence it is necessary to upgrade the first implant to N6 basic. It is a multichannel implant. With his increasing age, growth, hearing capacity & being a school going kid, its necessary to upgrade him to N6 basic. It costs INR 4,94,550 (Four Lakh Ninety Four Thousand Five Hundred Fifty only). There is no surgery or hospitalization required. It's been a month that Prashant is unable to hear. Ashok Jadhav (father of Prashant Jadhav) works as a mechanic in a car dealership in Mumbai. Though he is covered under ESIC, only half the sum would be covered by the institution. 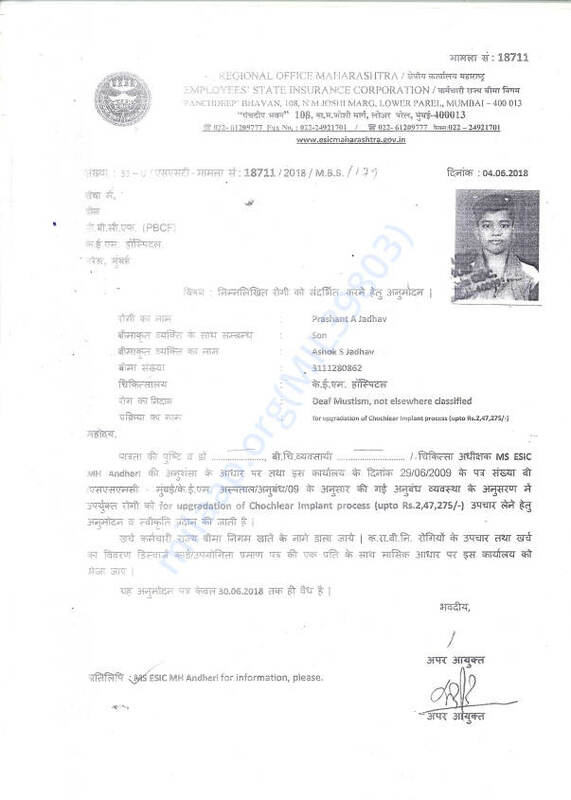 For upgradation of cochlear implantation process, a sum of INR 2,47,275 (Two Lakh Forty Seven Thousand Two Hundred Seventy Five Only) is required. Ashok with his limited resources will not be able to afford for the implantation process. KEM Hospital Mumbai has given them time till 30th Jun-2018 to arrange for funds or Prashant will never be able to hear and speak again. 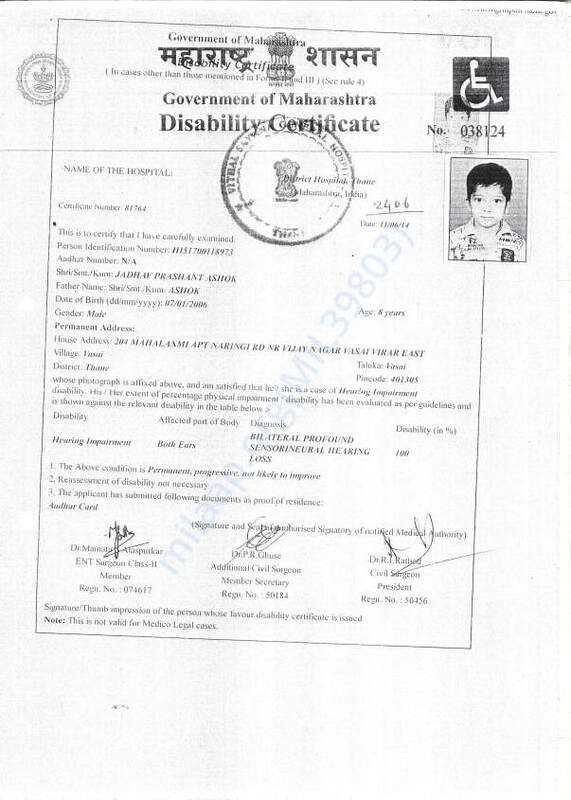 Ashok needs your help in giving his child a continued normal life. Thanks to your support, within 15 days of starting this campaign, we have successfully raised INR 88,047 through Milaap. We have managed to raise another INR 99,500 through a different source hence, totalling to INR 1,87,547. There is a shortfall of INR 60,000 for which we are exploring other sources. This amount will be of great help to the kid, enabling him to get his hearing ability back & lead a normal life. Once again we are grateful for your support.